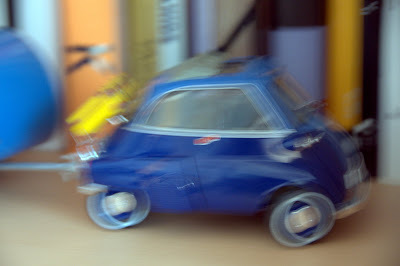 BMW Isetta scale model from Momentum BMW Dealer, Houston. I'm attempting to persuade myself to buy the ingredients and bake one of my blueberry cheesecakes for Tall Husband. He would be so surprised to have his favorite dessert for the holiday. What a lot of work but perhaps I can manage it. I'm off. It's such fun to peel out. I only recently learned that peeling out is not legal. Wheee! Off to the grocers, dentist, pharmacy, post office, florist, etc.